You do not arrive at the cutting edge of quality in digital confer- encing without gaining years of experience. Your home audio system probably is not the one you started with. Taste, wishes, environments and possibilities have grown over the years. 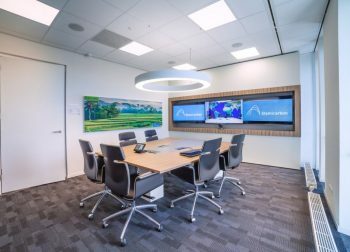 The world of digital conferencing systems is a jungle of standards, products and possibilities that present bewildering options to first time purchasers. You need a guide who leads you the way. There are many technological details that must integrate seamlessly. The end result is highly visible at board- room and customer level. Considerable amounts of money are involved. This makes digital conferencing a ‘high visibility, high involvement, high risk’ purchase. An analysis of your needs describing a detailed description or plan of everything you need to get started or expand your audio and video network. Strategies for your network for bandwidth usage, making sure you have ample bandwidth at a reasonable cost. An expert’s opinion on which equipment will be best for your purposes. Equipment that can handle future growth or be upgraded in the future without having to buy all new equipment. Training or finding a trainer to make sure users are familiar and can work the equipment. A helicopter view on your project, making sure all aspects go as to plan. This method guarantees that your requirements are always the central question. We also provide a second opinion when you feel uncom- fortable with the proposals or estimates from other suppliers. Organizational structure and established procedures are always our starting point when designing digital conferencing solutions. Your requirements are fundamental to achieving an optimal solu- tion with minimal adaptations to the existing infrastructure. Our consultants always think alongside their clients, and share the goal of finding the best solution for the minimum price. We are guiding our customers to a working solution in a phased method. Once a digital conferencing solution has been selected, we build test configurations. Testing can take place in-house at your company or at the conference room at our office. During the testing phase, you still have the chance to customize the system to your needs. After selecting a configuration, our consultants take care of the implementation and the training for you and your employees. Once implemented, we take full responsibility for the support and on-going maintenance of the purchased system. Should you only need the system for a short time period, there is also the possibility to rent a complete solution. We deliver not just the network facilities, but also the lighting, the audio check and even the furniture for the equipment. By constantly looking for innovative products and ideas, we are able to offer our clients the best technical, conceptual and financial solutions. Polymedia Europe delivers the cutting edge of quality in digital conferencing. We turn options into solutions. We have the knowl- edge, the experience, the systems and components. We have the indepen-dence to run your projects the way they should run, deliver- ing on your requirements. Our high-end approach always leads to high-end performance of digital conferencing systems. You can do your business without having to worry about technology. But, in the end it is not about quantity: its quality that really matters. End user satisfaction is our mission. Let us guide you to the cutting edge of quality in digital solutions. The cutting edge of quality in digital conferencing.